So, Valentine's Day is less than a month away... do you have plans yet? Alex and I have a reservation at Mon Ami Gabi and I'm excited. It's not super fancy, but I love French food and theirs is supposed to be excellent. It's also a Lettuce Entertain You restaurant and we have tons of their gift cards to use. Hooray for having fun while being frugal in 2014! If you haven't made plans yet and are in need of some inspiration, I have three great recommendations for you. I have dined at all of three of them recently and they are really different, but delicious in their own rights. They're all perfectly suited for a special occasion: romantic atmospheres, upscale menus, and unique features that set them apart from our typical Friday date night locales. Storefront Company is the perfect restaurant to take someone who is a bit of a food risk taker. There's no a la carte menu here-- it's a regularly updated tasting menu featuring locally sourced and seasonal ingredients. Normally I am skeptical about restaurants that only offer tasting menus as they are usually fancy, uptight, and really expensive. Storefront Company was none of these things-- in a good way. The atmosphere is a bit more laidback than you might expect from a Michelin Bib Gourmand restaurant. Located in the heart of Wicker Park, the restaurant decor is chic and modern, but the attitude is very relaxed. I met a friend here for dinner after hearing some great reviews. Dinner started off right when we ordered glasses of what is now one of my new favorite wines: a sparkling Pinot Noir. It's genius. And difficult to track down, but I managed to locate a few bottles of this Juve y Camps Cava Brut Rose at Binny's in downtown Chicago. Our third course was the Duck Egg (above) and when it arrived, it was nothing like I expected. The egg was prepared three ways: There was a Japanese-style omelet in the center of the bowl, which incorporated the flavors of Brussels sprouts and foie gras topped with a creamy egg custard sauce and garnished with lovely meringue leaves. It looked pretty enough to be a dessert, but the flavor was decidedly savory, rich, and totally unexpected. After the duck egg, our fourth course arrived. I have never tried squab before-- likely because the idea of young pigeon does not often equal deliciousness for mainstream diners like myself. However, I loved it! The preparation was fabulous: the sweet wintery flavors of quince and vanilla along with hearty endive and rutabaga really complimented the squab well. I ate every bite of this one! Even better than the chocolatey dessert course, for me, was the cheese course. A creamy petit livarot was served with a boozy pomegranate sauce and jelly, and walnut bread. It was sweet, savory, tart, creamy, and just wonderful. And the best thing about a restaurant with a tasting menu? They almost always send you home with a treat. And I love that. These little chocolate coconut cookies were perfect and so rich. A great way to end a delicious and interesting dinner. If you're looking to impress someone who is a bit more of a food traditionalist-- or you just want to have a good old-fashioned Chicago steakhouse date, Bavette's tops my list of recommendations. It has more of a 1920's European steakhouse vibe than your run-of-the-mill fancy steakhouses. You know the ones-- they're a little musty and feel like an old boys club? Bavette's is a perfect mix of classic and cool. Upscale, but not stuffy, with dim lighting and some very cool vintage-y decor. Alex and I dined here for our anniversary dinner-- a special occasion, indeed. And we both left feeling happy and totally stuffed. Everything we ate here was perfectly prepared and seasoned. It's a place that you immediately know that you'd like to visit again. Bavette's and their sister restaurants-- including Au Cheval, which I told you about before-- all serve this over the top thick cut maple bacon as a side dish that everyone raves about. We had it at Au Cheval so Alex was anxious to order it again... I talked him out of it since we both planned on ordering steaks and we found a good compromise: A perfect salad of watercress, roasted tomatoes, and a simple vinaigrette served with two slices of their signature bacon. The flavor combo of this salad is simple, but works beautifully together. Sweet and salty bacon, tangy vinaigrette, sweet roasted tomatoes, and peppery watercress... perfection. As I mentioned, Alex and I both ordered steaks for our entrees. He opted for the steak frites, a generous flatiron steak served with a huge portion of their thick cut fries. I went for the petite duchess cut filet. A filet is always my go to steak order and because we were eating so much other food here, the petite cut was perfect. Bavette's serves it with more of the watercress and roasted tomatoes, which although I had already enjoyed in the salad, but they compliment the steak perfectly. It was all finished off with a delicious and creamy Bearnaise sauce on the side. In my opinion, the side dish menu at Bavette's is just as much of a showstopper as the entrees. 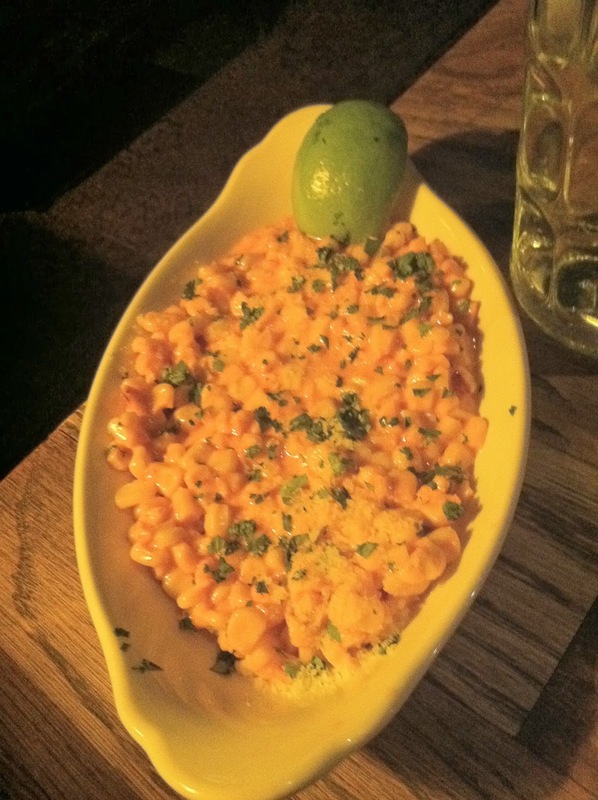 Several of our friends had raved about the elote style corn side dish, so I knew walking in that this was on our list. The corn is creamy with a hint of spice and super tangy from the lime juice. In addition to that we ordered the hashbrowns too. They were so good! A perfect balance of crispy edges and soft insides all topped with a generous serving of sweet caramelized onions. Another menu item that has come highly recommended by every friend that has tried it, is the chocolate cream pie. Well, I'm one of those people now. As you can imagine, we were really fully before dessert even arrived but this was so delicious that we almost finished it all anyway. It's a chocolate crust with a creamy chocolate filling that is light, but also firm-- and not in that gross eggy custard way. Topped with a huge dollop of fresh whipped cream, this is the ultimate dessert. One that cannot be missed, for sure... even if you have to order it to go! If you're looking for a romantic date night, look no further than RM Champagne Salon. I have told you about RM before after I met up with Kit for patio cocktails on a summer evening. Well, I had a chance to go back for dinner with Alex recently and it was a totally different experience! The restaurant is small and cozy with dim lighting, ornate French-inspired decor, and a roaring fireplace... even without hearing about the food, you're ready to make a reservation, aren't you? The menu at RM features a variety of modern twists on traditional French dishes with a variety of entrees and also a ton of great options for sharing too-- which is perfect for date night. Alex and I immediately found two appetizers to order: he loves deviled eggs more than anyone I have ever met, so when he spotted their version topped with Maine lobster. Like many deviled eggs before them, I didn't try them because Alex devoured them all. Luckily, I had the foresight to order one RM's Alsatian flatbreads topped with onions, bacon, and cheese. It's the same flatbread (a.k.a. a tarte flambee) that they served in all of the bars I visited in Strasbourg, France with my college girlfriends. The toppings are really rich, but the thin crispy crust is the perfect and canvas and the serving size is great for sharing. I ordered the buckwheat crepe for my entree. Tender crepes are topped with a warm spinach salad, apples, melty brie, bacon lardons, and a sunnyside-up egg. It was a little breakfast-like, but the flavor combination sounded so French and tasty that I couldn't resist. I think that anything topped with a runny egg is delicious and this was no exception. For a dish with several filling elements, the portion size was perfect-- it was satisfying, but not so big that I didn't have room for the appetizers or for stealing a few frites off of Alex's plate. And then, of course, we needed to save room for dessert. And RM is one of my new favorite places to order dessert. RM offers a menu of mignardises, or rather, a selection of bite size sweet treats that you can order a la carte. They offer several kinds of French macarons (which I love), truffles, handmade marshmallows, and artisan versions of mainstream chocolate candy bars. Alex and I each ordered a few to sample and it was such a fun way to end the meal-- not with a big rich dessert, but with a handful of different miniature confections! Fun list! Makes me want to go to Chicago for V-day! Thanks, Erin! We never run out of fabulous options here!